If you’re following ECOSYS, you’ll know we’re moving quickly past the high-level overview stage and on to process details. Our goal: to prove that virtual collaboration can drive social innovation. We ran our second #ecosys chat last night on Twitter; our transcripts are posted on NING . To achieve social innovation, we must first understand the building blocks of our social ecosystems; only then can we rearrange them in an optimal way. Consistent with the DNA metaphor, understanding and relating the building blocks of “how things work” is a fundamental first step to learning and to innovation. Sure, EcoDNA is just a process model. For practical purposes, we’re still at the starting line, revving our engines. But it’s an example of what virtual collaboration can achieve. 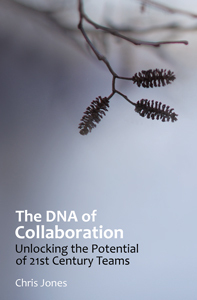 And for the complexity buffs, EcoDNA demonstrates our fist bit of “emergent” innovation. We have more housekeeping to do before moving on to addressing the big issues in healthcare and education. We’re hoping to keep most of our brainstorming sessions online, reaching a broad stakeholder base while documenting inputs in real time. We’re asking core team members to submit guest posts of their takeaways here, so we can establish a consensus (coming from diverse perspectives) of what we’re learning. Please stop back often. We’ll have much to report. You can follow or search Twitter hashtag #ecosys for daily insights. And check out TweepML to meet and network with the core team. Thanks for your interest. We’re excited about the potential, more so with every step. Thinker. Author. Explorer of edges. Passionate about learning and coffee. Founder of #smchat and #orgdna communities. Writing on Medium.